M.Sc Medical Anatomy is a 2-year post graduate degree program, the minimum eligibility is a B.Sc. Anatomy or any related discipline from a recognized institute or its equivalent exam. Interested candidates can get admission to M.Sc. Medical Anatomy on the basis of their performance in a relevant entrance exam, and subsequent round of counseling. The average tuition fee charged for the course in India ranges between Rs.5000 and Rs.5 Lacs for a span of 2 years. M.Sc. Medical Anatomy is a postgraduate programme. Graduate study in Medical anatomy provides advanced professional education in the essentials of Medical anatomy, including gross anatomy, developmental anatomy (embryology), microanatomy (cell biology/histology) and neurobiology. These applicants can get the job in institutes, colleges and universities very easily. The role can be in teaching as well as research. Candidates can also join government hospitals, health care centers, medical lab, private clinics, etc. 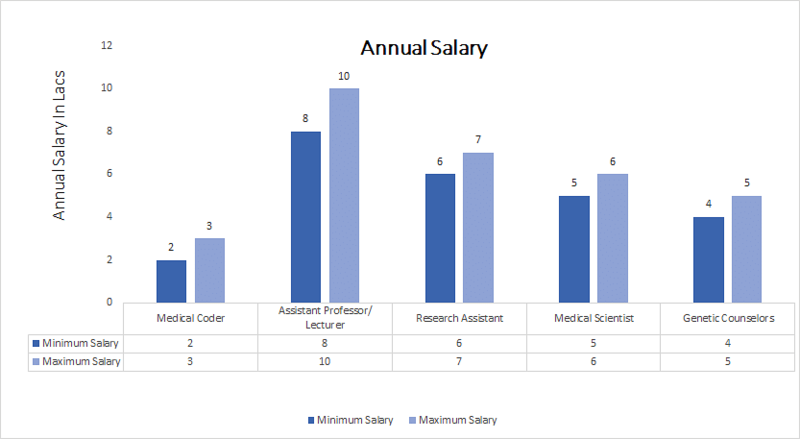 The top desired designations are research assistant, Medical scientist, associate profess and anatomy, Sr. Medical Coder and so on. Such postgraduates are hired in capacities such as Associate Professor Anatomy, Sr. Medical Coder, Medical Scientist, Research Assistant, Medical Writer etc. The initial salary for these positions in the government organizations varies from INR 2 to10 Lacs per annum. Top Recruiting Companies CIPLA, Fortis, Kauvery Hospital, Cadila Healthcare, AIIMS etc. Top Job Areas Colleges & Universities, Govt. Hospitals, Medical Labs, Private Clinics, Community Healthcare Services, Defense Services, Medical Writings etc. Top Job Positions Associate Professor Anatomy, Sr. Medical Coder, Medical Scientist, Research Assistant, Medical Writer etc. M.Sc. Medical Anatomy: What is it all about? M.Sc Medical Anatomy course concentrates on the scientific study of tissue structures, organ systems, and whole bodies together with their cellular and structural components and dynamics. The course includes study and investigation in cell biology, structural biology, molecular mechanics, regional and gross anatomy, neuroanatomy, endocrinology and secretory dynamics, embryology, and applications to such topics as aging and disease conditions. M.Sc Medical Anatomy is essentially the scientific study and investigation of the morphology of the human body. Anatomy is subdivided into gross anatomy as well as microscopic anatomy. Gross anatomy is the study and investigation of anatomical structures that can be seen by the naked eye. Microscopic anatomy is the study of moment anatomical structures helped with microscopes that involves histology, and cytology. Anatomy, human physiology, and biochemistry are complementary fundamental medical sciences which are generally together to candidates studying medical sciences. The course is suitable for subsequent studies in schools of medicine, dentistry, and nursing. The knowledge of the Medical body and its physiological processes gained in this program forms a significant foundation for physician assistants, physical therapists, dental technicians. It enables students to upgrade their knowledge and develop investigative skills by participating in projects in different areas in anatomical sciences, critical reviews of literature, a collection of material (field, experimental or literature), the processing, analysis, and evaluation of data. Course prepares individuals to seize diverse opportunities in health care and medicine, from patient care and disease prevention to public health, teaching and research. It is also beneficial for further studies such as M.Phil. and Ph.D. in the same or related domain of study. The candidates should have secured at least 50% aggregate marks or equivalent grade in B.Sc. (Anatomy), to be eligible for this course. Admission is through entrance test and interview. A lot of institutes in India offering M.Sc. in Medical Anatomy to admit applicants on the basis of their performance in a relevant entrance exam. Few colleges also admit applicants based on merit at the level of post-graduation, while some conduct their own entrance examination for offering admission. Admission process generally varies across colleges and institutes in the country. There is ample of career opportunities in this course; various medical companies are always ready for appointing good employees. Applicants can go research work in leading organizations and also in abroad. There are innumerable private institutes who are demanding M.sc in Medical Anatomy and give handsome salary.